Is porous. One would say they go through glass. Whence gushes forth a living soul returned to life. The debut of Jean Paul Gaultier’s Fleur du Mâle has been accompanied not only by references to poetry but by much talk (dare I say ‘mumbo jumbo’?) concerning the state of men’s lives in 2007. Léa Vignal-Kenedi, who heads the fragrance division of Jean Paul Gaultier, said in Women's Wear Daily: “Over the past 12 years [since the introduction of the original Le Mâle], many barriers have been lifted for men." She said men have more fashion and beauty choices and that Monsieur Gaultier “…wanted to speak of this blooming of today's masculinity, of joie de vivre, of happiness" (12/15/2006). Quoted in the Daily News Record, Vignal-Kenedi said: "Jean Paul wanted to demonstrate that men have a right to the same pleasures as women." Gaultier produces a men’s makeup line, Le Beau Male, and may believe wearing le maquillage and sporting a flowery scent (Fleur du Mâle) provide men “pleasures” they have been denied in the past. The way I see it, men who had the courage (and desire) to do so, were never denied the ‘right’ to put on some eyeliner and drench themselves with Diorissimo. 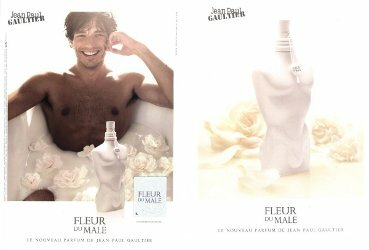 That being said, Fleur du Mâle’s advertising model is more ‘natural’ (hairier, less sculpted, and less uptight — he’s smiling) than Le Mâle’s posed sailors. Gaultier and his advertising and marketing team have stressed the fact that Fleur du Mâle contains orange blossom. Men have always used fragrances that contain orange blossom, from classic Eaux de Cologne to modern day scents. Supposedly, what is different about Fleur du Mâle is the overdose of orange blossom in the formula. I’m betting most men reading this review are not ‘afraid’ of floral notes in scents but perhaps the target audience of such a big mainstream-designer launch is wary of floral accords taking center stage in their fragrances. It will be interesting to see how popular Fleur du Mâle becomes. Like Le Mâle (1995), Fleur du Mâle was designed by Francis Kurkdjian; it contains petitgrain, orange blossom, a fern/fougère accord, and coumarin. Fleur du Mâle opens with the delicious scent of bitter orange leaves — vibrant and almost woody. Orange blossom? You smell it from start to finish and it’s a soft, natural-smelling orange blossom. Fleur du Mâle’s fougère accord is more mossy than herbal and the fragrance’s dose of coumarin smells like sugar cookies in fresh straw baskets. The development of Fleur du Mâle is seamless and the scent is rather linear. Fleur du Mâle brings to mind orange groves in bloom, glamorous black-and-white publicity stills, easy living and happy endings — yes, Hollywood, circa 1940. Fleur du Mâle’s languorous aspect, its dreaminess and sensuousness, would have suited Gary Cooper, William Powell and Laurence Olivier to a T — those men wore makeup on a regular basis and took their “right” to all pleasures for granted. *Note: Passages of poetry quoted from The Flowers of Evil (Academy Library Guild, Fresno, CA, 1954), via fleursdumal.org. disgust like Le Male! Did you buy a bottle? FdM was love at first sniff for me. There is an interesting indolic aspect of orange blossom in the mid-drydown (maybe it's the fern?) that balances out the sweetness, which is particularly appealing. Have you noticed it? I see FdM as a delicious orange blossom-vanilla mousse so its linear development does not bother me in the least. I got out and tested Le Male yesterday. *Loved* it. But definitely one that begs to be sold w/ a medicine dropper and instructions indicating that one drop is more than enough if you plan on being in enclosed spaces w/ other people. Fleur du Male is lovely, but I find I prefer Le Male. And I actually think Le Male is more in sync w/ Baudelaire than Fleur du Male. No, I'm not having a stroke, it's this dratted cellphone! To my mind, this is exactly what Gaultier2 should have been. Don't know how it will sell, but guessing lots of women will buy it. Totally agree w/ Elle that the original is more in sync with Baudelaire. I'd love to see the breakdown of sales figures in 6 months…but I guess no one would know how many men vs women purchased it? Nobody will know the male vs female, and I've been having trouble getting sales figures out of JPG lately, LOL! Anyway, if I can find a bottle at discount I'm buying it. And I would love to see some cool LEs with this bottle. It needs a tattoo! Or a JPG kilt with a floral print! Or a man-purse, since JPG wants men to have the same pleasures as women! The possibilities are endless. “The development of Fleur du Mâle is seamless” that I think is the key… perhaps a case of “too well blended” scent??. Certainly not strident notes at all. I believe that this is a bit easier on the power-scale than Prada's Amber pour homme or the surprisingly powerfull L'eau Blue de Miyake (Incredible sillage on that), but nonetheless I wouldnt wear it in midsummer without, as Elle says, a dropper to apply and instructions!! hehehehe. I gotta to try this scent. 2nd review read today saying it's really good. Welll, at least from the perspective of the reviewer. I heard some not too good things about it but now it sounds all good. I think I might like this one. I like the “Old Hollywood” reference you said to this one. I like anything that has to with Old Hollywood when men were not what you thought they were and wore makeup when they were in front of the cameras! LOL!! Still an elegant era. Kevin, what I think I left out of the comment is that I think this one will be a huge hit. This is a hit in my book, and will probably be the first Gaultier I'll own. Trulya departure from the male-torso bottle would be welcome on the next outing, dontcha think? I love how Gaultier is so unabashedly childlike in his creation of fragrances – subtlety be damned, batten down the hatches, here's my new scent! Love them or hate them, I admire him for not playing it safe and for being a little cheeky, too. I don't always enjoy wearing his scents, but when I'm feeling a bit brazen and don't care if someone smells me a mile away, one of his creations is perfect. Fleur de Male is fabulous, and I too have a hunch that many women will enjoy this. And Kevin and Robin — I LOVE your suggestions for LEs!! Perhaps you should take that consulting business seriously…. Norna: Sorry to hear it, but with the hundreds of new scents coming out I know you'll find SOMEthing to please you! When I tried this on at the department store, I could have sworn that there was vanilla in the base. The next day, I was smelling it on my scarf too. But right now I'm wearing Ambre Narguile from the Hermessences series, getting close to two hours since application, and I'm smelling a similarity between it and the Fleur du Male. Would that be the coumarin? What's the difference between coumarin and vanilla? Coumarin is extracted from tonka bean, and is said to smell like vanilla (used to be added to synthetic vanilla to make it taste more “real”, but IIRC, no longer used in food, at least in the US) but also like sweet, freshly cut hay, and is a typical note in fougere scents. FdM smells very vanillic to me too, as does Ambre Narguile. Fascinating! I love tonka bean as well (big fan of Armani Code for men and Hermès Vetiver Tonka), so that explains a lot. I'm considering buying a smaller bottle of Fleur du Male, as much for my fiancée as myself. I don't really like the traditional floral fragrances for women, but I quite like FdM, probably because it's definitely not your typical floral. Even as an admitted “straight guy with a queer eye,” I don't know if I'd feel comfortable wearing FdM myself, but I think I would like it on her. I've tried this a few times now, the latest yesterday, and hadn't really warmed to it. Well, I really liked it this time round, but couldn't escape the feeling that I already owned something simialr. Then it hit me: l'Occitane Neroli EdP. I duly sprayed the Neroli on my other hand and spent the rest of the day comparing them. To me the Neroli is the better scent, more natural smelling and with an edge that pushes it towards the masculine. It is also more linear than the Fleur du Male, which is great to me as I love its bristly opening. JA: Haven't tried the L'Occitane scent (I don't have good luck with their fragrances — they disappear quickly) but there are lots of orange blossom scents out there I prefer to Fleur du Male. When I first smelt a spray on the back of my hand, I was shocked and surprised at such an unusual scent. It was almost outrageously socking and different. I instantly dismissed it as being a commercial release for the masses that would be as popular as Le Male. As the day went pass, I realised that I couldn't stop sniffing my hand and desperately wanted it to have and add to my collection of favourite and precious perfumes. I bought a bottle the very next day! I love the fragrance of Le Male, but even though it was a fragrance designed and marketed towards Gay men, it had a strong popularity and following by most males in general. I deliberately avoided wearing it because it was so popular – the same reasons why I love JOOP! pour homme, but rarely wear it because every other male was wearing it. This fragrance is also a supreme favourite of mine. I realised then that it was the orange blossom in the fragrance that attracted me to it; so while Le Male is widely favoured, I prefer FdM instead, because of it's uniqueness and exclusivity. It now remains one of my most prized in my collection and I wear it at appropriate times, as it's not an everyday fragrance – it's a dangerous scent! Thanks for that comment, KevinS. It's much appreciated. I'm pleased to know that you also consider these fragrances 'highly dangerous'! I actually go out of my way to locate such scents, like Secretions Magnifiques(ELdO) and KOUROS/Body KOUROS (YSL), Kingdom (McQueen) and my great desire is to get my hands on Muscs Kublai Khan by Serge Lutens. My boyfriend accidently tipped a whole lot of this down the front of his shirt whilst browsing the perfume section of our local department store last night… we shopped for a little longer but were both in love with the scent by the time we got back to our car. We snuggled and watched DVDson the couch afterwards and i have to say that the smell got even yummier as the night wore on. After a couple of hours it ended up smelling almost exactly like Jean Paul Gaultier Classique for men…. 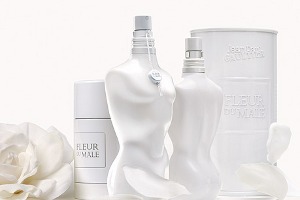 one of myall time faves… Fleur D Male is fast becoming a new fave!